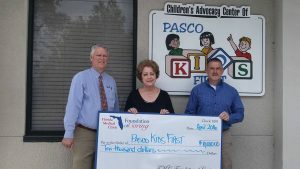 The Florida Medical Clinic Foundation of Caring selected Pasco Kids First as a grant recipient in the amount of $10,000. Founder of the Foundation Mrs. Sheri Schwab and her husband Dr. Richard Schwab toured the Pasco Kids First Children’s Advocacy Center in New Port Richey. The funds from the grant are being used to provide therapy services for children who have experienced a traumatic event. The FMC Foundation of Caring was founded in 2005 and has assisted 90+ organizations with more than $2,000,000 in contributions. To learn more visit: http://fmcfoundationofcaring.org.